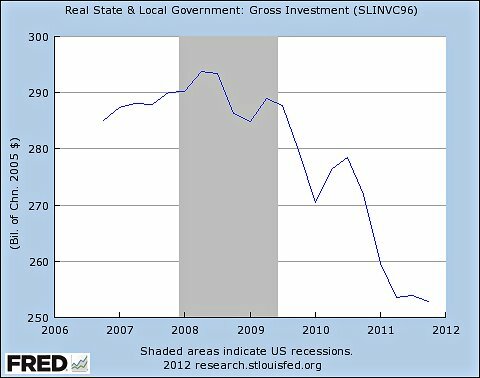 The drag that state and local budget problems are contributing to the economic recovery looks dismal, as in depression economics dismal. The contribution to real GDP from states and local economies is in negative territory with the pain of cutbacks being shouldered by real people in the form of cuts to education and lay-offs of police, fire fighters, teachers, draconian cuts to the elderly, the disabled, the poor. This policy of focusing on cuts rather than raising revenues to balance state and local budgets is being done under the baseless notion that austerity and tax cuts to business will grow the economy, but the numbers, over and over and over, tell a story diametrically opposite to that “business-friendly” narrative. The irony here is that there is nothing “business friendly” about it. Small businesses are suffering through the lack of consumer demand these policies contribute to. Laid-off workers don’t buy goods and services. Small businesses feel the brunt of this stifling of demand, laying off their workers, foregoing new investment to grow their business, purchasing less inventory. Those that benefit from the tax cuts already enacted add little to growth as the wealthy to whom these cuts go either save their windfall or invest for their own benefit. Again, the numbers show state and local contributions to real GDP are negative – putting the brakes on the economic recovery. These mythological “job-creators” are not creating jobs, and to consider this the only way to grow Maine’s economy is wrongheaded. As a vocal proponent of this austerity in the face of budget shortfalls Governor LePage is more the problem than the answer. Selling our future short for the temporary gain to the wealthiest in Maine is not in the interest of the long term prosperity of our State. Repeating the meme that it is so does nothing to make it so. But the Governor seems completely innoculated against that logic. As noted previously, even the Maine Revenue Services acknowledges that fairer taxation that brings the wealthiest Mainers into line with other taxpayers would cover the DHHS shortfall.